Polish Poker Face | Use Your Words | Kids VT - small people, big ideas! I grew up in East Detroit, just a few miles away from my paternal grandparents, but they've always been a bit of a mystery to me. My grandfather died in 1983, when I was 8. I remember he used to read to me, and I know he loved to garden, but he was dead for 20 years before I learned his real first name. I discovered it by accident. I happened to glance at his tombstone while walking through the cemetery after my grandmother's funeral. According to the marker, his name was I. Sylvester Resmer. Puzzled, I asked my dad what the "I" stood for. Wasn't his first name Sylvester? "Everybody called him that, but his first name was actually Ildephonse," my dad revealed. "He hated it. He never wanted anyone to know." There were lots of things no one seemed to know about him — like when he arrived in the United States. My grandfather was born in Poland, but neither my father nor his three siblings know exactly where, when and how he came to the U.S., nor what his early life here was like. I knew my diminutive and affectionate grandmother better. She occasionally babysat my sister and me when we were sick, and I saw her regularly at family gatherings well into my adulthood. Anne Gorski Resmer was born in Detroit to Polish parents. Like everyone else we knew, she was Roman Catholic. But there's still so much I don't know. What did she do before she met my grandfather? Where did she go to school? What was it like living in the Motor City during the boom years and the race riots? She never mentioned any of that and didn't elaborate when I asked. In my family, I learned, we just didn't talk about stuff like that. We kept our focus on the present — on family, church, the weather, our health. When my grandmother and I talked about my life, I'm not sure she understood what I was saying. For example, I was on the forensics team in high school. It's the "sport" of competitive public speaking. I knew my grandmother was proud of me: A suburban weekly once ran a story about our team, and she cut it out and displayed it on her fridge. But in my senior year, she confessed that she was confused. Every spring, I went to a forensics tournament at the Grand Hotel on Mackinac Island in Lake Huron. "Where do they keep the bodies?" she asked earnestly. For four years, she thought I had been dissecting corpses. Our one shared interest was playing games. Grandmom loved Rummikub and knew lots of card games. My favorite was a simple, fast-moving one she called "Shveen." The name, she said, meant "screw your neighbor" in Polish, but I've never been able to confirm that. 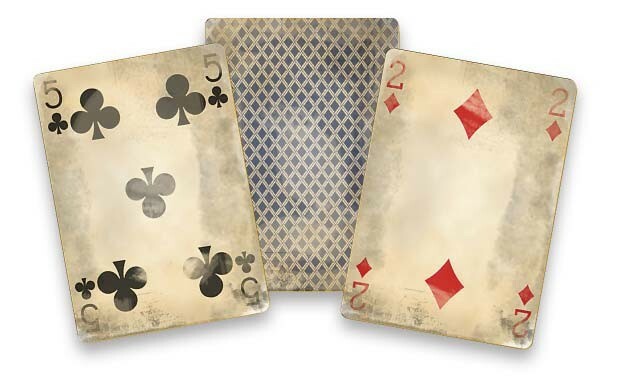 The dealer distributes a single card to each player. The player on the dealer's right gets to keep his or her card or trade it with the next player. The object is not to get stuck with the lowest card in the hand. Keep the card you're dealt and you run the risk of losing; trade it and you may wind up holding one that's even lower. It all comes down to whether you think the person sitting next to you has a better card. With my grandmother, it was always hard to tell. I'd have a five, and she'd be sitting next to me smiling innocently. She'd make me believe I couldn't lose by trading with her. Then she'd pass me a two. In our family's version of the game, players start with three dimes each and throw one into a pot every time they lose. The last person with money left keeps all the cash. Whenever Grandmom won, she'd chuckle mischievously while scooping up her loot. One of my favorite Shveen games took place in November 1998, while my partner, Ann-Elise, and I were visiting my parents. Ann-Elise joined me, my sister, my grandmother and some cousins in a game at the dining room table. She'd never played before, but she won twice, taking all of Grandmom's spare change. My grandparents weren't the only ones holding back. I introduced Ann-Elise to my grandmother as my friend. The rest of my family knew that we were dating, but I didn't want to tell Grandmom. I felt dishonest but sensed that she wouldn't approve. I didn't want to disrupt my relationship with my grandmother. By the time Ann-Elise and I got civil unioned in 2000, Grandmom was in an assisted-living facility. I didn't invite her. I don't think she knew about the ceremony. My life must have been a bit of a mystery to her, too. But we had other ways of communicating. One of the last times I visited her, I brought my accordion to her room and played a few songs for her and my parents. I don't remember what we said to each other then, but I remember that her eyes lit up and she smiled as I played.